If you visit my site and ever pay attention to the side gutter, you may have noticed this. I get a fair number of questions via various media: Twitter, Twitter DM, email, etc. A lot of the answers to these questions wind up being blog posts or even series. The Chess TDD series actually got started this way. But something occurred to me recently. I formed a hypothesis. It’s probably only the most outgoing folks or those with whom I already have a relationship that will engage me in this way, meaning that a good chunk of the readership may want to ask questions but not have a comfortable venue for it. As such, I’m drawing on the lessons of science classes growing up and running an experiment: I’m introducing this form. It seems like a lower barrier entry way to submit a question, at least to me. If I were reading a blog and wanted to ask the author a question, I might hesitate to email her since it’s not clear that she actually wants such questions. But if she had a form on her blog saying, “ask me questions,” I wouldn’t feel any such reservations. So, the experiment works if I wind up with more submissions to the form than I get email questions. I installed a plugin on my site using a WordPress plugin called Ninja Forms. It’s dead simple in that it lets me build a form, put it anywhere with a shortcode, and collect the submissions in a database table that it builds. I had to do very little for this, and viola. I’ve made both fields of the form required. 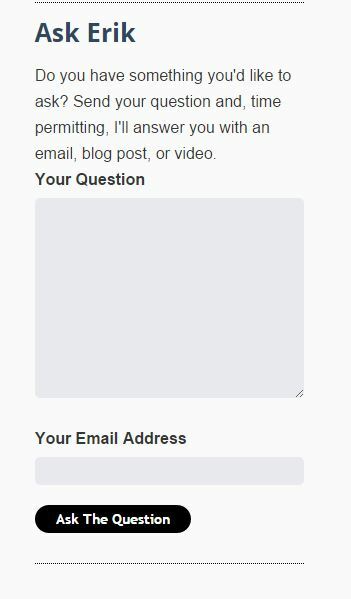 The form makes no sense without the question, obviously, but for email address, this gives me a vehicle for communicating with you about the question. That’s a minor barrier to entry, I realize, but you can type in a nonsense email address if you really don’t want to share that information. I’ll still add a card to my blog posts Trello board, but I won’t be able to engage you directly or ping you when a post goes live. Also worth mentioning is that a question means a card added to the Trello board and no guarantee of anything else. Ultimately, I may write a post about it here or I may answer with a video on my youtube channel. I may also just email you a response. And, any of those things might take a while for me to do, depending on what’s going on in my life. I haven’t yet hit the point where I’m not able to address everyone that reaches out to me, but I’m getting pretty close. But please, by all means, reach out. I don’t struggle to think of things to write about, but with a more engaged audience, I can be sure I’m writing about things that readers find valuable. Odds are, if you’re asking the question, tens or hundreds of readers are also thinking it. Having explained the new form, I’ll leave you with a thought to mull. I talked about the scientific method here with this form. I hypothesized that more people would engage if I lowered the barriers to entry, and I’m running an experiment to validate that hypothesis. This is something I’m trying to do a lot these days. When you pare out the frills and folklore, both the Lean Startup and the agile software movement are, at their cores, about applying the scientific method to their domains. I suggest internalizing the scientific method and doing your best to apply it in your day to day. Instead of making assumptions and operating on them, form hypotheses and think about how you can corroborate them. Whether to your friends, peers, or a gathering of C levels, presenting with data is almost always more compelling than presenting with flair alone.